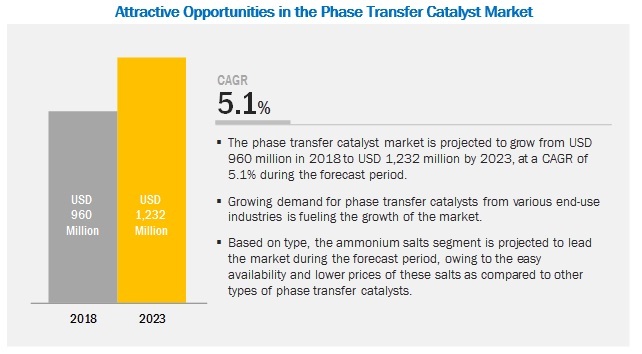 [98 Pages Report] The phase transfer catalyst market is projected to grow from USD 960 million in 2018 to USD 1,232 million by 2023, at a Compound Annual Growth Rate (CAGR) of 5.1% during the forecast period from 2018 to 2023. Rising demand and adoption of green chemistry in organic synthesis is the major factor driving the growth of the phase transfer catalyst market across the globe. Based on type, the phosphonium salts segment is projected to be one of the largest contributors to the phase transfer catalyst market during the forecast period. Phosphonium salts are a major type of quaternary onium salts. The phosphonium salts segment is projected to be second-largest type segment of the phase transfer catalyst market from 2018 to 2023. These salts are ionic compounds with the formula (R)4P+, where R is an organic group. Phosphonium salts are capable of tolerating high temperatures fluctuations. Methyl triphenyl phosphonium bromide, methyl triphenyl phosphonium chloride, ethyl triphenyl phosphonium bromide, ethyl triphenyl phosphonium chloride, and benzyl triphenyl phosphonium chloride are some of the phosphonium salts used as phase transfer catalysts. Phosphonium salts are expensive as compared to ammonium salts. Based on end-use industry, the pharmaceuticals segment of the phase transfer catalyst market is projected to grow at the highest CAGR from 2018 to 2023. In the pharmaceuticals industry, compounds used for drugs are generally complex multifunctional molecules, which are built up by a sequence of chemical reactions. Phase transfer catalysts are used in the pharmaceuticals industry in synthesis, R&D, drug formulation, and laboratory applications. Moreover, the imposition of stringent regulations in the western regions on the use of harmful compounds in the pharmaceuticals industry is also leading to the increased consumption of phase transfer catalysts in the pharmaceuticals industry as they eliminate the requirement of using organic solvents and dangerous, inconvenient, and expensive reactants. These catalysts also reduce the generation of industrial wastes. 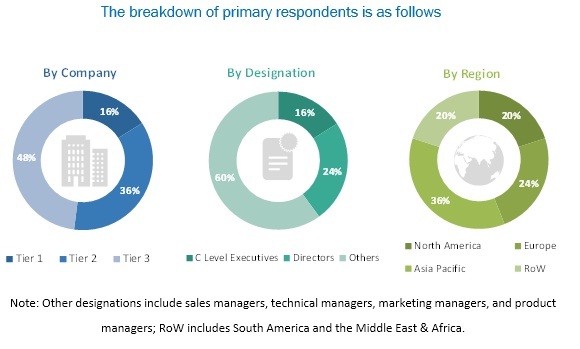 The pharmaceuticals segment of the phase transfer catalyst market is projected to witness significant growth in the Asia Pacific region during the forecast period due to increased demand for these catalysts from emerging economies of the region. The Asia Pacific phase transfer catalyst market is projected to grow at the highest CAGR during the forecast period. 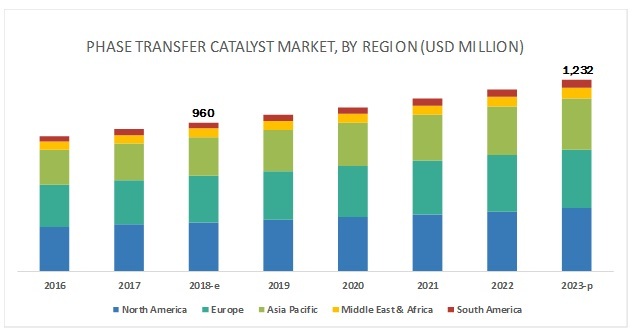 The growth of the Asia Pacific phase transfer catalyst market is driven by the increased demand for these catalysts from countries such as China, Japan, Australia, South Korea, and India. Ongoing industrialization and flourishing end-use industries such as pharmaceuticals and agrochemicals in emerging economies such as China and India are also driving the growth of the phase transfer catalyst market in the Asia Pacific region. SACHEM Inc. (US), Tokyo Chemical Industry Co., Ltd. (Japan), Nippon Chemical Industrial Co., Ltd. (Japan), Dishman Group (India), PAT IMPEX (India), Tatva Chintan Pharma Chem Pvt. Ltd. (India), Central Drug House (P) Ltd. (India), Pacific Organics Private Limited (India), Otto Chemie Pvt. Ltd. (India), and Volant-Chem Corp. (China) are the key players operating in the phase transfer catalyst market. In 2012, SACHEM, Inc. introduced Salego BASE 1000 series, which are used as phase transfer catalysts in the pharmaceuticals industry. This launch helped the company in meeting the increased demand for organic synthesis manufacturing techniques in the pharmaceuticals industry. What are the future revenue pockets for the phase transfer catalyst market? What will be the future product mix of the phase transfer catalyst market? What are the prime strategies adopted by leaders in the phase transfer catalyst market? Which key developments are expected to have a long-term impact on the phase transfer catalyst market? How is the current regulatory framework expected to impact the growth of the phase transfer catalyst market? 10.2 Tokyo Chemical Industry Co., Ltd.
10.3 Nippon Chemical Industrial Co., Ltd.
10.6 Tatva Chintan Pharma Chem Pvt. Ltd.
10.7 Central Drug House (P) Ltd.
10.10 Otto Chemie Pvt. Ltd. The study involved 4 major activities to estimate the size of the phase transfer catalyst market across the globe. Exhaustive secondary research was carried out to collect information on the market, its peer markets, and its parent market. The next step was to validate these findings, assumptions, and sizing with the industry experts across the value chain through primary research. Both, top-down and bottom-up approaches were employed to estimate the overall size of the market. Thereafter, market breakdown and data triangulation were used to estimate the size of different segments and subsegments of the market. In the secondary research process, various secondary sources such as Hoovers, Bloomberg BusinessWeek, and Dun & Bradstreet were referred to so as to identify and collect information for this study on the phase transfer catalyst market. These secondary sources included annual reports, press releases & investor presentations of companies, white papers, certified publications, articles by recognized authors, gold standard & silver standard websites, food safety organizations, regulatory bodies, trade directories, and databases. The phase transfer catalyst market comprised several stakeholders such as raw material suppliers, processors, and end product manufacturers. The demand side of this market was characterized by the development of the pharmaceuticals and agrochemicals industries. The supply side was characterized by the market consolidation activities undertaken by the manufacturers to offer phase transfer catalysts. Various primary sources from both, supply and demand sides of the market were interviewed to obtain qualitative and quantitative information. Key players in the market were identified through extensive secondary research. After arriving at the overall market size-using the market size estimation process explained above—the market was split into several segments and subsegments. To complete the overall market engineering process and arrive at the exact statistics for each market segment and subsegment, data triangulation and market breakdown procedures were employed, wherever applicable. The data was triangulated by studying various factors and trends from both, demand and supply sides. This research report categorizes the phase transfer catalyst market based on type, end-use industry, and region.